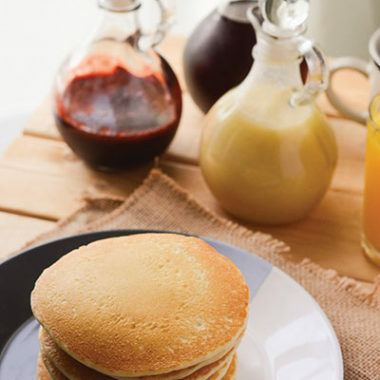 Three homemade syrup recipe favorites! Maple, buttermilk, and strawberry - all frugally homemade and fantastic on pancakes, waffles, and crepes! In a medium pot, bring sugars and water to a boil for 1 minutes. Whisk in extracts. Allow to cool for at least 30 minutes before using. Combine buttermilk, sugar, and butter in a pot over medium high heat, and stir, allowing butter to melt and ingredients to combine. Bring to boil for 1 minutes, then remove from heat. Whisk in baking soda and vanilla until combined - mixture will foam, so you may want to do this over the sink! Serve while still warm, or heat up if using from refrigerator. Combine strawberries and 1/2 cup water in a pot over high heat. Bring to a boil, then reduce heat to medium and cook 15-20 minutes, until berries have broken down. Stir in remaining water and remove from heat. Strain juice from berries using a fine-mesh sieve set over a bowl. Discard solids, and return juice to pot, adding sugar and bringing to a boil over medium heat. Reduce heat to low and simmer another 5-10 minutes until thickened. Whisk in vanilla and remove from heat. Serve while warm.